I can’t think of a better One Piece character to start off with. Luffy D. Monkey is the hero of our title this month and the captain of the Straw Hat Pirates. Although he can be absent-minded, overly boisterous and just down right exhausting, Luffy is a man with a golden heart. He is willing to literally stick his neck out for his friends and often puts his own life on the line for the safety of not only their physical being but their hopes and dreams. He is the perfect choice for a Green Lantern and before I get into why exactly, let me tell you a bit about the Green Lantern corp itself; in terms of admittance, design, etc. The GLC is an intergalactic police forces that patrols up to 3600 sectors of the universe, accumulating over 7200 members in the entire corp, as two lanterns are assigned to patrol each sector. Members are chosen by the ring for being able to overcome great fear, as well as for their notable responsibility and honesty. Upon recruitment, each Lantern receives a Power Ring, a Power Battery shaped like a lantern (with which the ring is recharged), and a uniform. The default uniform design was a green section covering the torso and shoulders, black arms and legs, green boots, white gloves, green domino mask, and a chest symbol of a stylized Green Lantern icon on a white circle (Reference Picture here). Lanterns were allowed to customize their uniforms as long as the color scheme and the symbol were present . 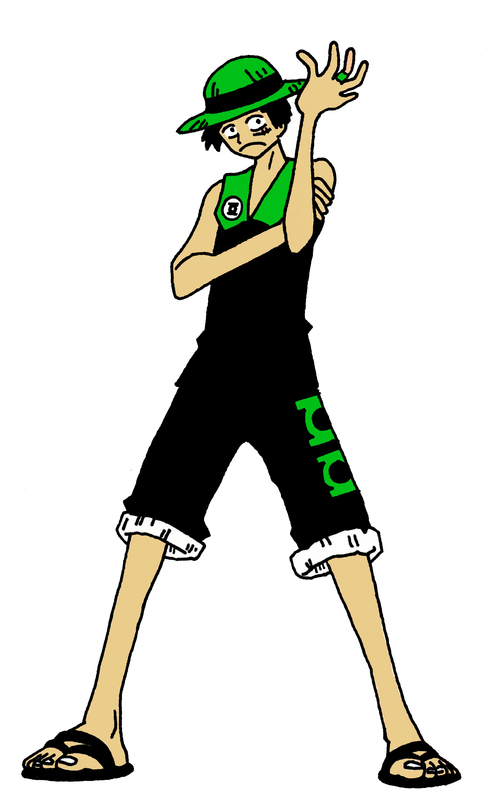 Luffy’s costume was very easy to design, because although Luffy fits the honest and strong willful nature of a Green Lantern, I see him being very particular about what he wears. Meaning he wouldn’t be too keen on wearing a uniform like everyone else. So I didn’t want to take that individuality from him. Also, what he’s wearing originally synchs up with what a Green Lantern stands for. His vest, which is usually open, and torn shorts show that Luffy isn’t afraid of hiding anything about him; he is exposed to the world around him. Despite the individualistic differences, this look is still very uniformal though. Black is the most dominant color, creating a sleek, powerful look, which is accented by the green at the top of his vest & hat. It’s color theory in action; the Black, a color normally associated with power, grounds & empowers Luffy while the Green, close to his heart and mind, allow him the freedom to pursue new ideas. Its a very balanced look and gives Luffy a much-needed composure, which make him perfect for fighting crime. I really like subtly, especially when it comes to symbolism, so instead of going for the big, bold Lantern smack dab on Luffy’s chest, I placed it off to the side, as well as on the left side of the pants. David Welsh or the Manga Curmudgeon said that they reminded him of pockets, which he thinks Luffy would need considering all that he eats. All in all, as I said before, I think Luffy is the perfect candidate for a Green Lantern, especially when it comes down to the Straw Hats. It was and wasn’t a tough decision; of all the emotions to choose from, Luffy can be paired with a number of them. He is hopeful in his dream to find One Piece and form his ultimate crew. He is compassionate towards others, especially his crew; look at the Arlong Park arc, as he comforts Nami in his own way before jumping into battle. When Luffy sets his mind to something, he will stop at nothing until it’s complete. And that’s why he’s a Green Lantern.